Fast forward to the Fall of 2010 and we find the DSO on strike. The issue is, of course, money. The DSO musicians are very well paid, but no orchestra in the world supports itself from ticket sales; they are all subsidized to some degree by private or public funding. Therefore, when there is a downturn in the economy, both sources of funding (public and private) dry up and the red ink flows. Despite the following “statement” and intervention by the Governor, Jennifer Granholm, and Senator Carl Levin, there is no solution in sight. “The Detroit Symphony Orchestra (DSO) is one of America’s greatest musical ensembles, one of Detroit’s true cultural jewels, and a major public institution that helps define Southeast Michigan’s quality of life. 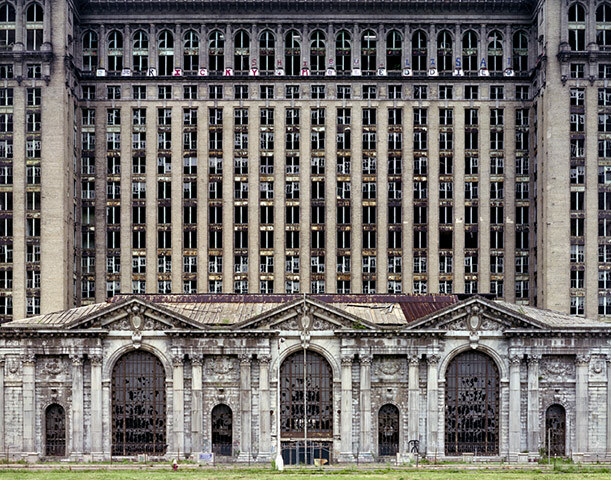 A thriving DSO is also a foundational element of a ground breaking public-private-philanthropic plan to revive Detroit’s Midtown section. Like other nonprofit cultural institutions and other symphonies around the country, the DSO is experiencing extremely difficult times financially. Many members of the DSO board and other patrons have given generously even in these difficult times. Yet the symphony has been running a significant and unsustainable deficit, its endowment is shrinking to a critical point, and its creditors are calling in loans connected with the construction of the Max Fisher Music Center. For the sake of Detroit and Michigan we must preserve this musical gem. Since late September Senator Levin and Andrew S. Levin, on behalf of Governor Granholm, have met separately and together on a number of occasions with several dozen people who are party to this dispute. These meetings have included symphony board members and management staff, the musicians and their union leaders, the attorneys representing both parties, state and federal mediators, the ad hoc citizens committee formed to encourage settlement of the dispute, and numerous leaders from the business, labor, civic, and philanthropic communities. We have participated in multiple sessions involving both parties and their lawyers, in which the major areas of dispute were discussed in depth. These discussions have led us to several conclusions: (1) A new contract will require a significant reduction in compensation to the musicians for the orchestra to survive; (2) creating and executing a plan that allows the symphony to thrive in the future will require close collaboration and teamwork between the DSO management and musicians, which will require building relationships of trust going forward; and (3) despite how difficult negotiations have been to date and the bitter feelings this labor dispute has engendered, the parties are within striking distance of an agreement. When we first met formally with the two sides on November 3, we told them we would engage in discussions to try to help facilitate a deal, and then if the parties had not yet reached an agreement, make a public recommendation about key terms still in dispute. We have arrived at that point today. First, we recommend that the parties agree to a three-year contract with total compensation of $36M, conditional on all other aspects of an agreement being reached. Compensation in the last three-year contract was $48M. Management has proposed compensation of $33M to $34M. We realize that a $36M contract will be a bitter pill for the musicians to swallow and a difficult target in terms of fundraising and sales requiring a strong and cooperative effort by all parties. But this is our best judgment on what is a fair and workable compromise. 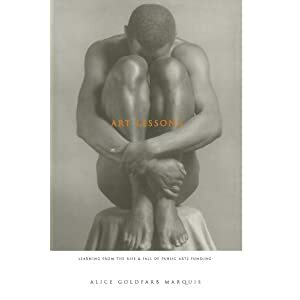 In an earlier post, I referenced a book that I think everyone in the arts should read entitled “Art Lessons: Learning from the Rise and Fall of Public Arts Funding” by the late Alice Goldfarb-Marquis. In the book, she details how a surge in public funding for the arts occurred in the middle of the last century, which created an artificial demand for artists and arts organizations of various types (dance, music, theatre, etc.). Thus, in current parlance, an “arts bubble” was created which relied almost solely on donors, both public and private. She also identifies how those benefactors began to move away from arts funding in favor of other charitable donations (hospitals, education, etc.) that provided them with the visibility and cachet that the arts no longer provided. An “aberration from the norm” is another way of saying that the last 75 years have truly been a bubble, which supports Goldfarb-Marquis’ analysis and thesis. Additionally, the historical aspect of this reading is correct–very few musicians prior to the 20th Century ever generated an income stream capable of supporting a family, much less the kingly sum of $130,000 (approximate average yearly salary and benefits of a DSO member). Those that were able to generate a meagre income, did so through the patronage of the church or the aristocracy. Goldfarb-Marquis’ book was published in 1995, at a time when funding was already waning. It seems that the situation is now exacerbated and accelerated due to the recent recession. The difference from previous recessions, if Goldfarb-Marquis was correct, is that the arts won’t recover as they have previously because the large public donors will not return in force. The DSO is now asking the Detroit City Council to assist, presumably by providing funding, although it is unclear what they expect from the Council. 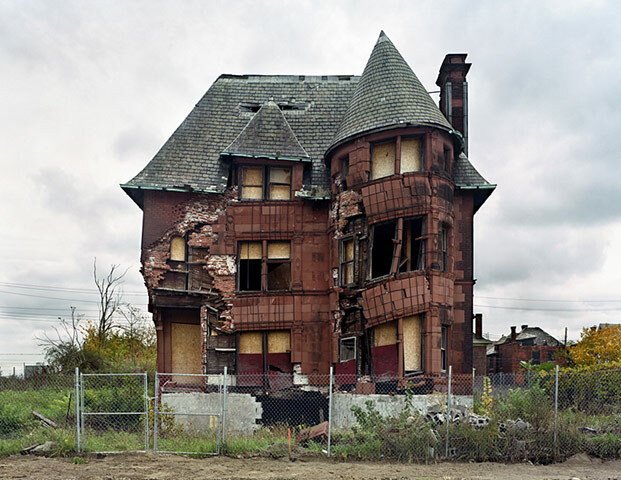 To assess the Council’s position, let’s take a tour of Detroit, something I do several times a year driving home to visit family. 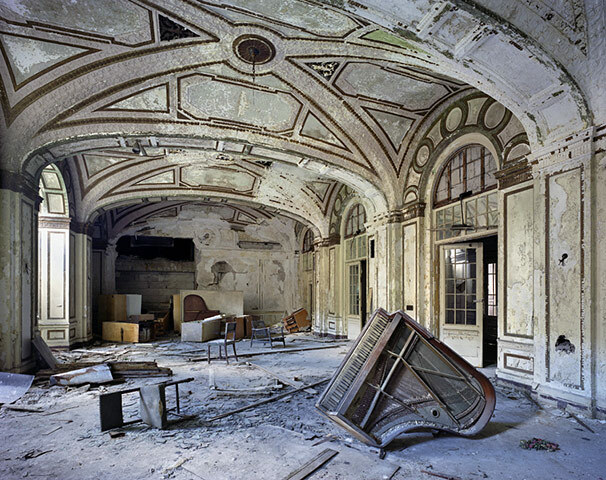 Note: All photographs by Yves Marchand and Romain Meffre. In the midst of this blight, the city has basically thrown up its hands and given up even trying to provide basic services to its citizens. Services “such as schools, firefighters, buses and garbage collection” will not be provided “to large areas of the city.” People will not be forced to leave certain areas, but they “need to understand that they’re not going to get the kind of services they require.” Get ready for Mad Max Detroit: Beyond the Thunder Silverdome. Given all of this, I think it is safe to say that the City Council has some fairly serious and pressing concerns that take priority over the plight of the DSO. As such, there is no way that the musicians of the DSO, deserving as they may be, will be paid anywhere near the level to which they have grown accustomed. The arts bubble (among many others) has burst and it is unlikely that the orchestra can, absent some deus ex machina (i.e. Bill Gates doing a fly-by in a modified B-52, carpet bombing the DSO with $1000 bills) ever return to the delightful “aberration” (if indeed that is what it was) of the latter half of the 20th Century. *Side story: I was mugged in Greek Town (the heart of downtown Detroit), with a group of friends in 1979, so I know whereof I speak. A close friend of mine, now deceased, was mugged a few years later in the same area (just a few blocks from the Police station). He had a gun put into his mouth and was told he was about to die. Fortunately for him, the assailant passed out; unfortunately for the assailant, he passed out behind my friend’s ’65 Chevy and was run over repeatedly as my friend tried to escape before the mugger woke up from his drug-induced slumber to make good on his promise. Musical literacy is also dead. i can olny predict that private funding will continue to dry up, as the demographics change. You would be hard pressed to find anyone under 60 yrs old who cares about classical music. The appreciation and or understanding of music in general is no longer part of American culture. 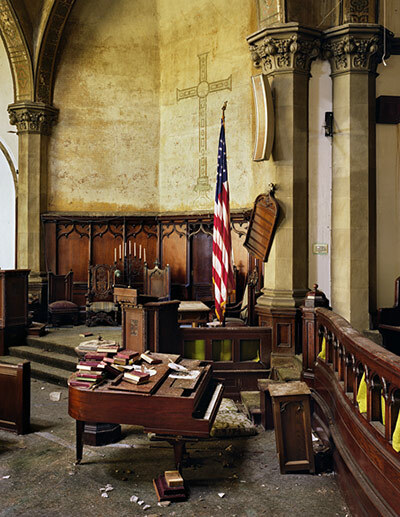 The image of the upended piano is very appropriate. Perhaps the time has come to re-evaluate how communities support the arts. Outside of the present fiscal challenges, there are also cultural challenges with the current model many communities follow. As noted in a previous comment – who cares? what/where is the audience? Rather than trying to maintain community orchestras [or ballet, opera companies, etc], might the money be better spent on establishing community facilities that provide rehearsal, production, and performance spaces? Might this better align with the present – and future – needs of the community? I suspect this approach will not favor excellence, but it may encourage participation and help us rebuild an audience for music. And it would foster more innovation. And this model does not exclude the possibility of utilizing private and corporate support to maintain traditional or new arts organizations.